In line with the objectives of IYCr2014, professors and researchers from the Science and Engineering Schools of U. Nacional de La Plata (UNLP) and the School of Exact and Natural Sciences of U. de Buenos Aires (UBA), Argentina, had been organizing intensive courses, crystallization competitions and workshops since 2013 to better spread the knowledge of crystallographic techniques and methods within Argentina and across Latin America. 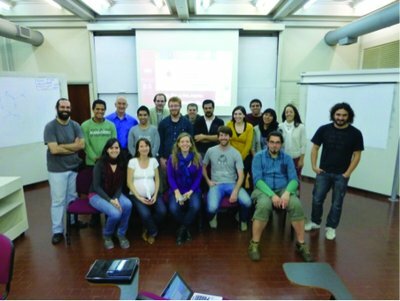 With this background, the teams were ready to carry out the IUCr-UNESCO OpenLab initiative for IYCr2014 when Agilent Technologies and OlexSys Ltd offered to partner an OpenLab to be run in UNLP and UBA. The scheduled dates of the intensive course were from May 3 to 10, 2014. 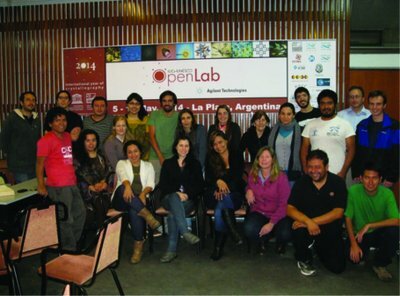 The OpenLab attracted about 80 applicants who were students, researchers and even some faculty from all over the world. The 37 selected delegates included post-docs, recent MSc, PhD graduate students, MSc graduate students, one professor and three undergraduate students finishing their research work to get their undergraduate degree. They came from universities and research centers in Argentina (20), Bolivia (2), Brazil (4), Colombia (3), Costa Rica (1), México (2), Perú (2), Uruguay (2) and USA (1). The international team of lecturers and instructors was composed of O. Piro (OP), UNLP; L. Suescun (LS), U. de la República, Uruguay; L. Daniels (LD), Agilent Technologies; Horst Puschmann (HP), OlexSys Ltd; G. Echeverría (GE), UNLP; G. Punte (GP), UNLP; R. Baggio (RB), Comisión Nacional de Energía Atómica (CNEA) of Argentina; and F. Di Salvo (FDS), UBA. Massimo Nespolo (U. Lorraine, France) opened the OpenLab on behalf of the IUCr. The attendees were introduced, online, to OLEX2 by HP and worked with LD on solving a rather difficult structure applying the charge-flipping method. Before splitting into two groups, La Plata and Buenos Aires, the participants learned about the different crystallographic databases and their uses (LS). All the material is available at http://isfc2014.fisica.unlp.edu.ar/. For the rest of the OpenLab, the attendees were introduced to crystal-growth techniques and asked to form small groups for practical sessions on crystal-quality recognition, crystal selection, mounting on a goniometer head and getting a data set. These data were used to follow a step-by-step route to reconstructing the electronic distribution of an organic compound including a heavy atom from its single-crystal X-ray diffraction intensities. The procedure included the determination of the space group from the examination of the list of reflections and of the heavy-atom position from the Patterson map analysis, followed by the Fourier maps to obtain and refine the molecular model and, after reaching a good R factor, a Fourier synthesis to ensure the reliability of the solution achieved. At this stage the use of any graphical interface that might induce black box solutions was avoided. Finally, there was a discussion about the data interpretation, molecular geometry analysis and data presentation, along with the application of appropriate programs. These activities were led and coached by LD, GE and GP in La Plata and by LD, RB and GDS in Buenos Aires. They were performed in a warm-hearted and pleasant atmosphere that encouraged participation and helped form the basis for future collaborations between attendees and between attendees and lecturers. Those participants desiring credit points had to take an online examination within a month.